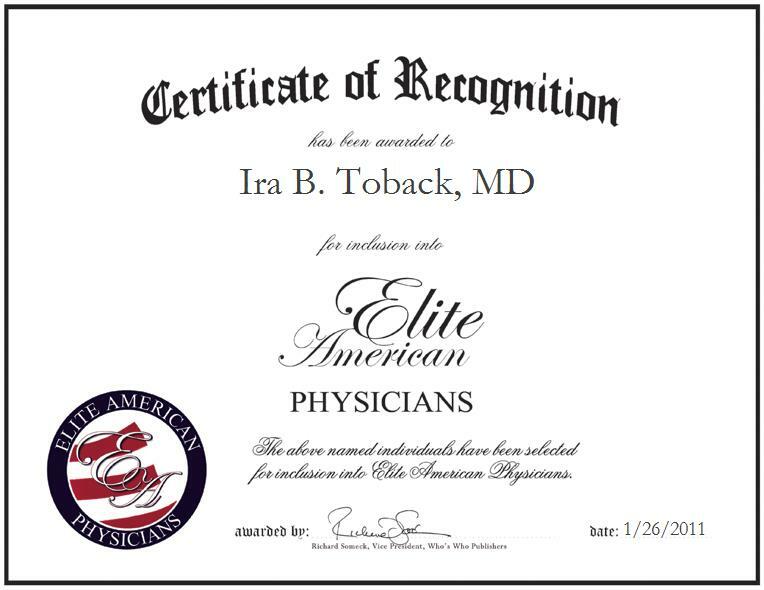 Hicksville, New York, January 26, 2011, Dr. Ira Toback has been recognized by Elite American Physicians for dedication, achievements, and leadership in pediatrics. Guided by his desire to help others, Dr. Toback has three decades of comprehensive experience as a practicing physician. Specializing in pediatric care, he performs routine checkups and treatments to infants, children and adolescents whilst demonstrating his intrinsically caring nature. In addition to managing his own health care facility, Dr. Toback serves as chairman of the finance committee of Allied Pediatrics and an associate professor of pediatrics at Cornell University. In recognition of his excellence, Dr. Toback was named Professional of the Year representing pediatrics for 2010/2011 by Cambridge Publishing. He earned an MD from the Catholic University of Louvain in Belgium in 1976, and has taken workshops to stay current with medical advancements in the industry. When he is away from his professional duties, Dr. Toback enjoys watching sports, and finds solace in walking leisurely.